Rotational grazing can help Kentucky farmers increase forage productivity, which can increase yield of animal products per acre and any increase profit margins for forage-based farming systems. A rotational grazing program can generally be defined as use of several pastures, one of which is grazed while the others are rested before being regrazed. Continuous grazing is the use of one pasture for the entire grazing season. 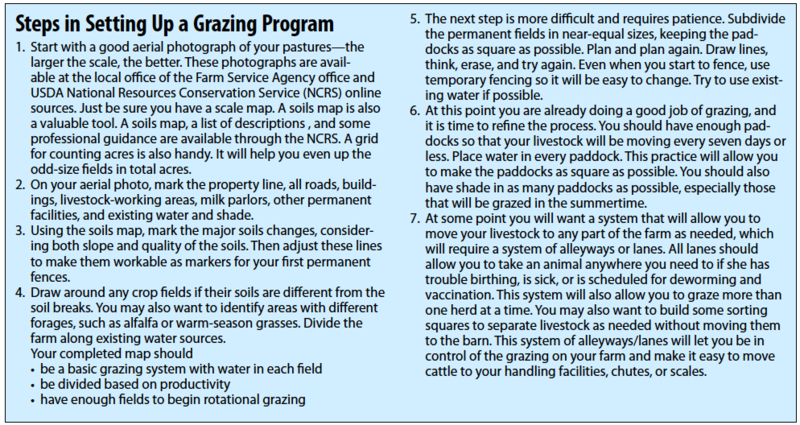 To read the full details on rotational grazing, download the University of Kentucky publication below. Winter feeding of cattle is necessary part of nearly all cow-calf operations. In winter months, livestock producers often confine animals to smaller "sacrifice" pastures to reduce the area damaged from winter feeding. This publication describes the problems with traditional winter pasture management and the benefits,, construction, and implementation of a winter feeding structure that can be used in conjunction with managed grazing practices. To continue reading, download the University of Kentucky publication below. This time every year cattle producers are burdened with the task of trudging through mud to feed and care for their cattle. Many producers have come to accept the mud and mess, while others question their sanity (as many farmers do now and then). Which leads to the age old question: Why do I spend eight months out of the year getting my pastures into shape and then turn around and tear them up during winter feeding? Is there a better way? For producers who are serious about rotational grazing and need a tool to protect their pastures, here is a suggestion: Build a multipurpose barn that could be used for not only winter feeding, but also serve many other purposes related to optimum beef production.